Did you ever climb a 3-story fireman’s ladder to a little platform about 2 feet square? I did, and it’s pretty high up there! I went to the French Woods Festival of the Performing Arts summer camp this summer. It’s in Hancock, New York, up near the Canadian border in the Catskill Mountains. They have one of the largest circus pavilions in the world. When you get to the top of the ladder, there’s already somebody there who helps you into a harness that’s attached to a “guide rope”. Someone on the ground holds onto the guide rope to stop you from hitting someone else or falling outside the big net that’s supposed to catch you. But it’s pretty scary the first time. After that, though, I couldn’t stop smiling. 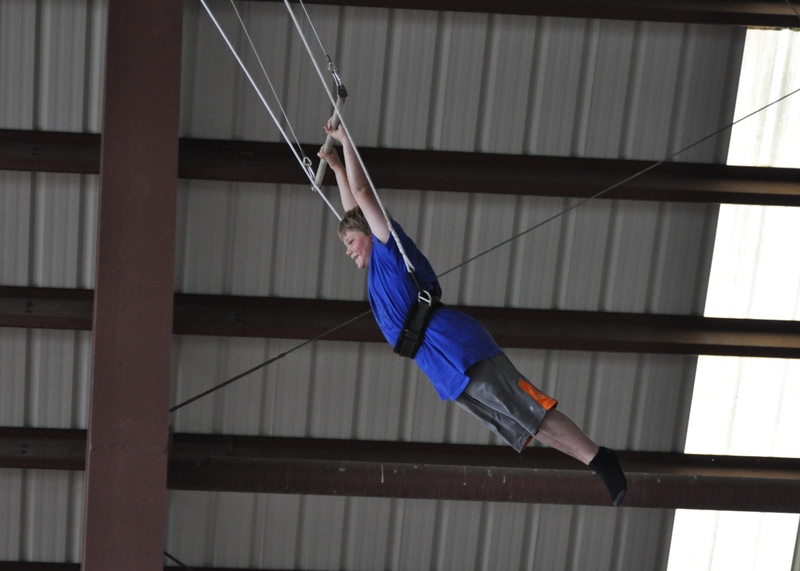 I loved it up there, and I can’t wait to get back on the flying trapeze soon! I’m a friend of your Grandmother Deb. You’re a great kid, Kameron, and I have been following your progress as recorded in your Grandmother’s Facebook posts for months. Keep up the good work and you’ll be able to join Circ du Soleil when you grow up. Wow, you are brave, and that looks like so much fun! Keep it up- great blog!